The Seven Rivers of Citrus County Florida. Citrus County is often referred to as the land of Seven Rivers. The area is a water lovers paradise. Residents of Sugarmill Woods can enjoy the Gulf of Mexico, Kings Bay, several lakes, the many natural springs, and of course the rivers. The Gulf of Mexico offers endless recreation from pleasure boating to fishing. The gulf offers up a bounty of fish to even the novice fisherman. 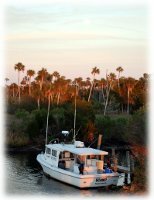 And with over 300 sunny days each year, the gulf is alive with sail boats, pontoon boats, and fishing boats as well as sun worshipers of all ages. Kings Bay in Crystal River is the pathway to the Gulf of Mexico. The calm sheltered bay offers an even wider array of water activities. Boaters often pull the kids on inner tubes as well as water skis. Jet skis and wave runners are also popular in Kings Bay. For the more adventurous, there are dozens of dive shops all around the bay offering boat rentals along with snorkeling and scuba diving gear. There are many caves and springs to explore in the bay. 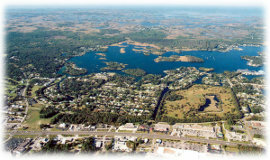 The Crystal River as well as the Homosassa River and Halls River flow into Kings Bay. These are natural spring fed rivers, being supplied by millions of gallons of fresh water pumped up from the Florida aquifer every day. 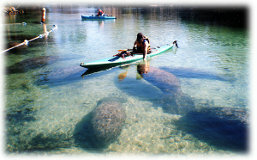 The water is a constant 72 degrees all year round, which attracts the Florida Manatees. Actually, they are West Indian Manatees. Once mistaken for mermaids by early sailors and explorers. These gentle, warm-blooded mammals are attracted to the relatively warm waters during the cooler winter months, some stay all year round. Crystal River represents the largest population of these endangered, prehistoric sea cows. At the local dive shops you can go on a manatee tour and actually swim with the manatees, an experience you will not soon forget. Along the banks of the Crystal River where it empties into Kings Bay you will find The Crystal River Archaeological State Park. The site gives the first glimpse at the earliest settlements in Citrus County. For approximately 1,600 years (200 B.C. until A.D. 1400), people of the Deptford culture appear to have occupied this site. The 14 acre six mound complex is one of the most imposing prehistoric ceremonial centers on Florida's west coast. Some of the most pristine and protected rivers in the area are the Rainbow River and the Weeki Wachee River. The Rainbow River is also spring fed and the head waters originate from Rainbow Springs where there is a State Park. At the Rainbow Springs State Park there is archaeological evidence that people have been using this spring for nearly 10,000 years. Rainbow Springs is Florida's fourth largest spring and, from the 1930s through the 1970s, was the site of a popular, privately-owned attraction. The Rainbow River is popular for swimming, snorkeling, canoeing, and kayaking. Further down the Rainbow River you can rent an inner tube and while away the day as the current takes you down the crystal clear waters to witness all the serene beauty of the area including all the wildlife. At the end of your journey a shuttle will return you to where you started. A half-hour drive south of Sugarmill Woods is Weeki Wachee Springs which supplies the Weeki Wachee River and is home to the famous mermaid attraction and amusement water park. This unique attraction opened in 1947 featuring an underwater glass auditorium, called the Mermaid Theater where you can enjoy the aquatic show. Outside you can thrill to the over 50 foot high water slides that empty you into the spring waters. 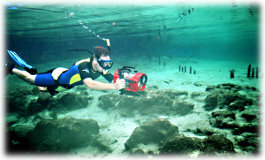 Homosassa is of course named after the Homosassa River which is fed by the Homosassa Springs. The Halls River is a tributary off the Homosassa River. These rivers are also home to many sheltering manatees during the winter months. There is also a permanent home for any injured manatees at the Homosassa Springs Wildlife Park. The zoo-like park offers an underground "fishbowl" where you can walk down and view the graceful manatees swim by in their natural environment with out getting yourself wet. The park is, as well, home to black bears, bobcats, white-tailed deer, American alligators, American crocodiles, river otters, countless native birds and even a hippo named Lucifer. 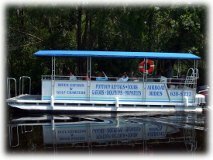 The nearby Homosassa river is a great place to relax in a canoe or kayak and go on a pontoon boat tour, sunset cruise or even attend the Dragon boat races at the annual event. If you love being, in, on or around the water, you will feel right at home in Sugarmill Woods and Citrus County!